We at The Natural Sleep Store believe you can never have too many blankets (or pillows, or sheet sets, but those are giveaways for a different month)! That is why we are excited to offer the Organic Chenille Stripe Blanket by Organics and More as our Earth Day giveaway! The Organics and More Organic Chenille Stripe Cotton Blanket is a wonderful mid-weight blanket which makes it perfect for adding extra warmth to your bed on those cold winter evenings. It’s also the blanket you love so much you drag it off your bed so you can curl up on the couch with it during a marathon Netflix session. It’s soft, so it feels good next to your skin, and it’s warm—the cozy kind of warm that you want in a blanket. And it’s cuddly, not stiff, so it’s easy to wrap yourself up in it. 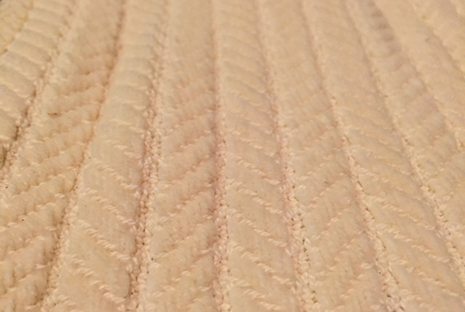 The undyed, natural color and understated yet attractive chenille stripe complements any décor, so you won’t mind leaving it draped over a chair. We love this blanket for all of those reasons, along with the added benefit of being made in the USA with GOTS-certified organic cotton yarns grown in the USA! The Organic Chenille Stripe Blanket by Organics and More is soft, cuddly, organic, healthy, warm and pretty—all the things you want in a blanket. You’ll love it so much, one won’t be enough! Enter to win our Earth Day Giveaway of an Organic Chenille Stripe Blanket (choose your size, a value up to $172) No Purchase necessary to win. Giveaway ends April 30th, 2016. Congrats to Lori of Ballwin MO, you won our Earth Day Giveaway!